For more than 20 years, Dr. Robin Siebold has worked with individuals and organizations imparting the skills, insights and strategies that make life more manageable and meaningful. 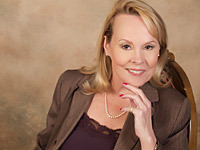 From self-esteem issues and relationship roadblocks, to corporate training in leadership, motivation and now collaborative law and parent coordination, she employs a powerful blend of traditional counseling psychology, spirituality and metaphysics to empower people to make powerful, lasting changes in their lives. © 2005 Robin Siebold. All Rights Reserved.